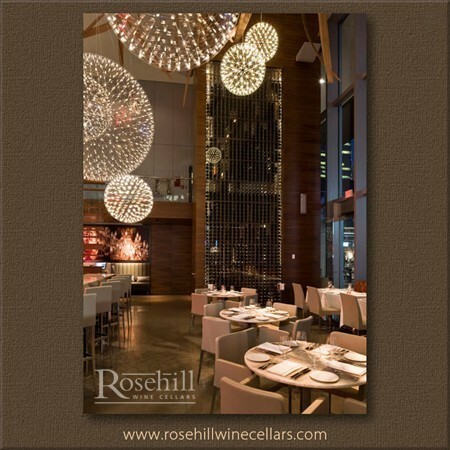 (SL) A statement featured within this high end restaurant in downtown Toronto is its 30 foot floor to ceiling wine racking within the climate controlled wine cellar. The cellar is designed with individual single bottle wood racking. 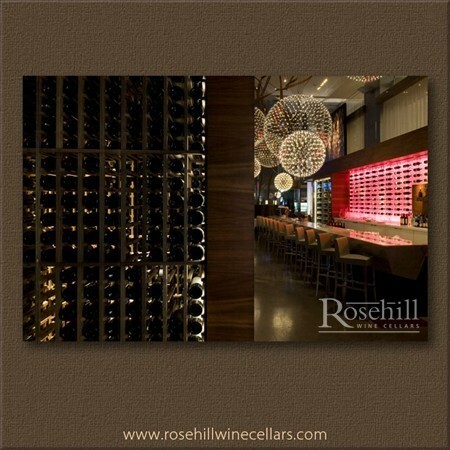 This expansive wine wall is a focal point within the restaurant for all the clientele to admire. (SL) The massive floor to ceiling wine cellar is a stunner. Bottle storage features individual bottle storage in excess of 1,000 bottles. 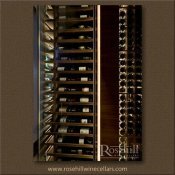 The wooden wine racks are stacked to create a continuous 30ft high wall of wine. 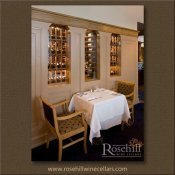 The exterior casing of the glass enclosed wine cellar is a walnut facade with bees wax finish, to complement the interior decor of the restaurant. (SL) Directly behind the bar features a commercial display area. This area is comprised of multiple rows of angled single bottle racks to showcase bottle labels. (SL) This custom floor to ceiling wine racking, makes a statement within the modern contemporary look of the restaurant. Stunning both inside and out! With a bottle count in well over 1,000. 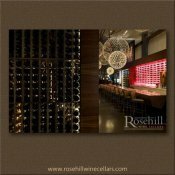 Individual bottle storage was used in the feature wall of the cellar to maximize bottle count and to provide visual continuity in the look of the custom wine cellar. (SL) Adding another vertical element to this commercial design is a multi bottle horizontal wine racking display. 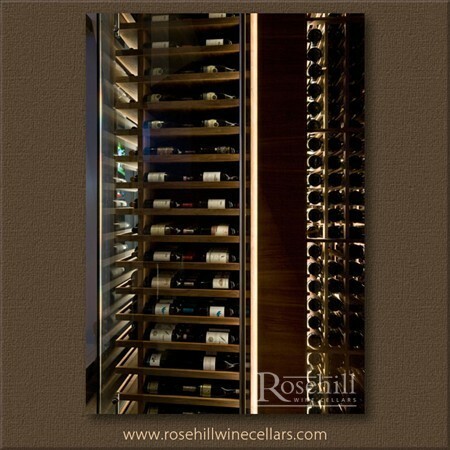 The sideways orientation of the bottles allows additional bottles to be stored within a narrow area of the wine cellar to further maximize storage. (SL) In this area of the restaurant, two custom wine racking display designs are incorporated. 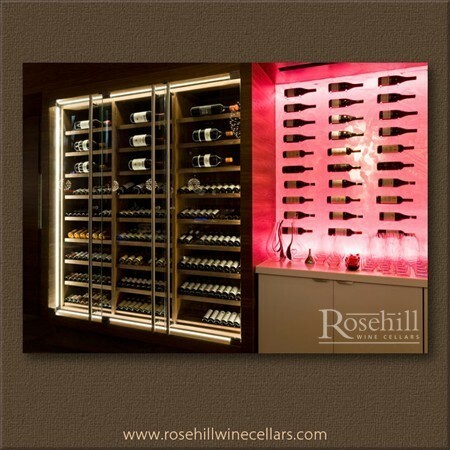 One a more traditional design with six levels of presentation display racking plus horizontal display racking; while adjacent to it is a more modern wine wall with pink back lighting. 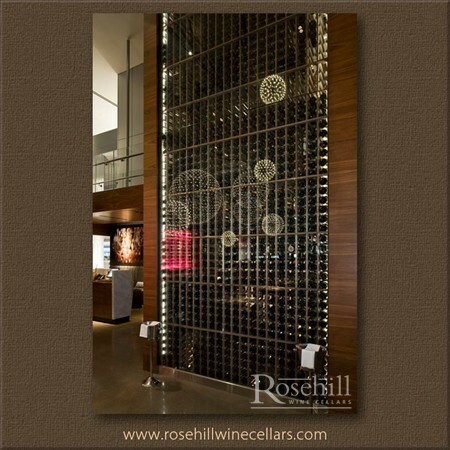 This elongated square uses the individual bottle peg system for front facing label display. (SL) This back view of the restaurant shows a small section of the floor to ceiling custom racking wall, with the bar area to the right. 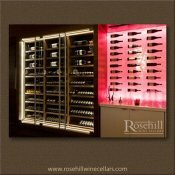 Behind the bar is a modern single bottle peg system wine wall which is backlit with pink lighting. 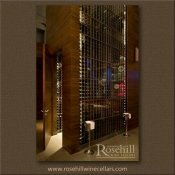 (SL) Check out this massive floor to ceiling walk in custom wine cellar. 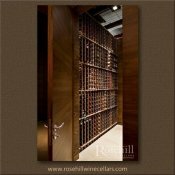 The exterior of the custom wine cellar, is finished in walnut with a bees wax finish, inside features individual single bottle storage in wood racking designed to run the height of the restaurant at about 30ft. .
(SL) This is an impressive entrance to this commercial wine cellar in restaurant setting. 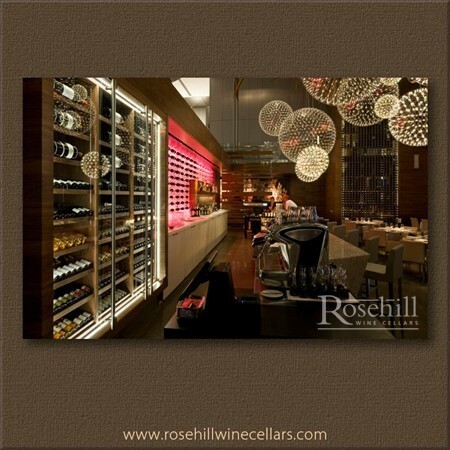 The back wall of custom racking, provides floor to ceiling, individual single bottle storage. 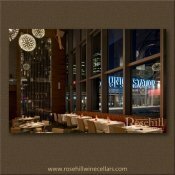 The same racking style is repeated on the front facing wall of the restaurant. (SL) In a unique space racking can sometimes be a bit of a challenge. 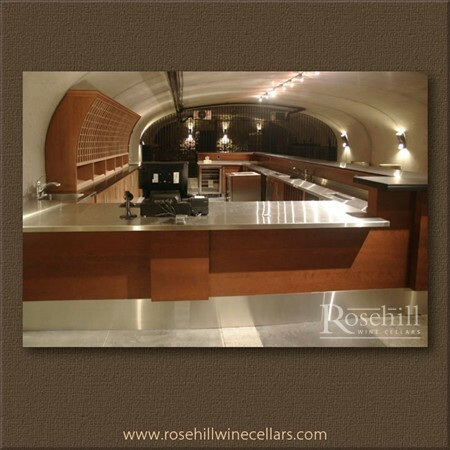 A custom designed curved wine racking solution was created to fit the needs of this tasting area. 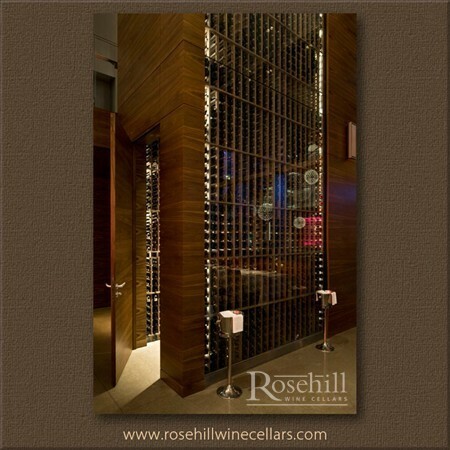 The design provides, individual single bottle storage and bin case storage in the tasting bar. 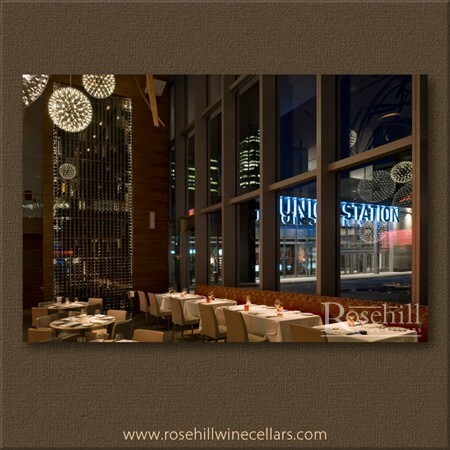 (SL) A unique feature within this restaurant incorporates three viewing windows into their custom wine cellar. The wooden wine racking is adjacent to the glass but allows a glimpse of the cellar and presentation display racking within. ,. The horizontal label forward display racking showcases the label on the bottles.